If you are a beginner gardener and would like to start growing herbs, this list of easy to grow herbs will help you decide what to cultivate. If you like to cook even a little bit, at some point you start thinking about growing your own fresh herbs. The cooks on TV always use them and rave about the difference in flavor over those jars of dried ones. 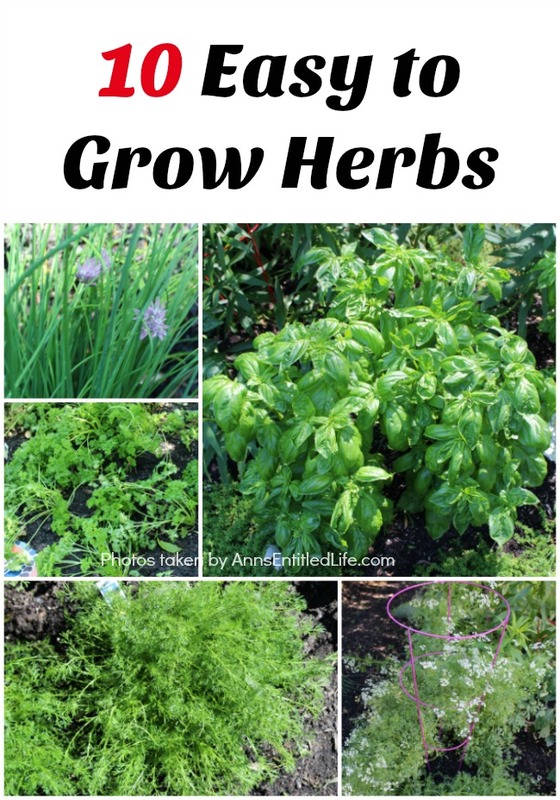 It is much easier than you thought to grow your own herbs! Here is a collection of some of the easiest to grow in your garden. First a word about growing herbs – for the most part, they do not require much care. If you grow them in a sunny spot, water when dry, and harvest no more than one-third of the plant at any one time, your herbs should reward you with abundance. • This is very easy to grow. If you like pesto, grow this one! Start from seeds several times during the spring/summer season to keep your supply coming in as long as possible. • Keep flower heads pinched off to promote leaf growth, and remove top buds to make plants bushier (do not allow the plant to bolt). Annual – you will need to replant every year. 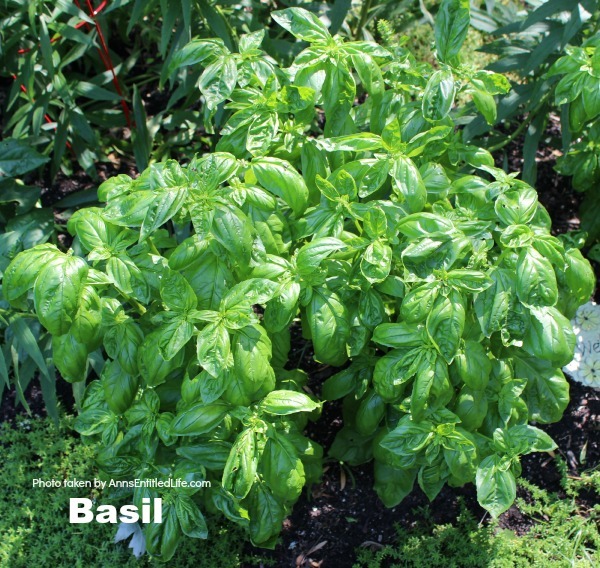 Here are some simple instructions on How to Harvest and Grow Basil. • Deliciously fragrant flowers and leaves have a sweet apple flavor. • Dried flowers are great in potpourri and make a flavorful and relaxing tea. • Ideal for a fragrant herb lawn which can tolerate foot traffic. I plant this and it just BLOOMS!! 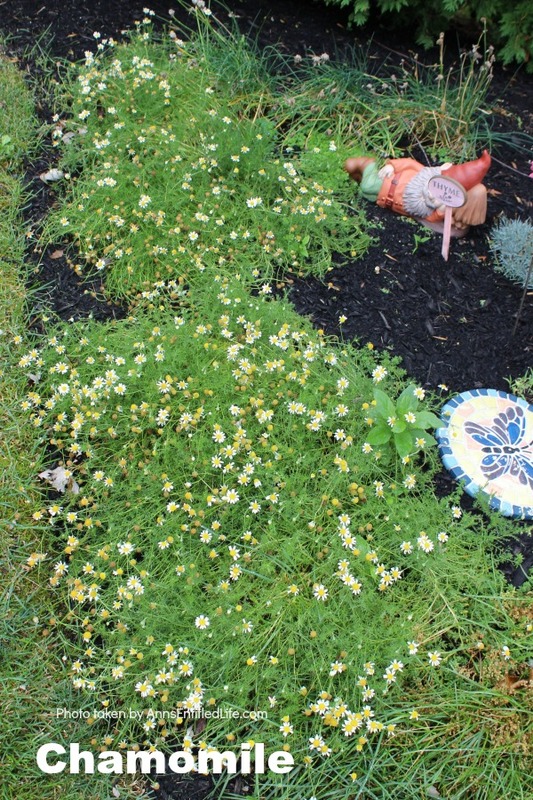 Just walking by my chamomile plants make me smile – they are so fragrant! • Maintenance: trim every 6 weeks.ack every other month. Perennial – sun, water weekly during dry spells, feed in spring. • Easy to grow from seed. Plant in an area where you want to enjoy their purple flowers, even in a flower bed. They will re-seed themselves if you leave a few of the faded blooms. 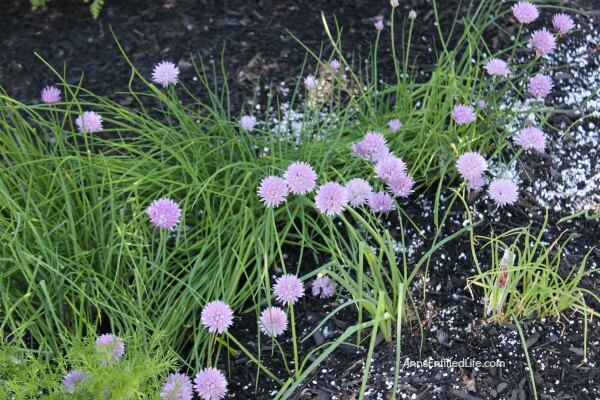 • Chives may grow up to a foot tall and have long tubular leaves. • Clip them as needed to use wherever you might want a very mild onion flavor. • These are another very simple herb to grow – I just allow them to regrow year after year with little maintenance (divide every 3-5 years). Perennial – full to partial sun, water weekly during dry spells, feed in spring. • If you like Mexican food, this is a must-have. You can sow seeds directly in the garden as this one does not transplant very well. 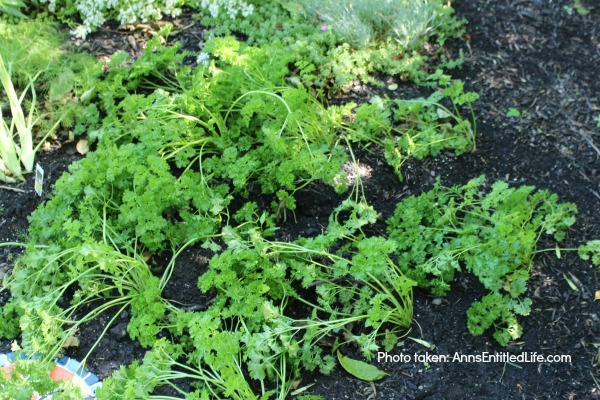 Plant at the beginning of the spring and again in summer to ensure your cilantro supply will remain as long as possible. There is nothing better than salsa made with fresh tomatoes and garden grown cilantro. • Cilantro is known as coriander in some areas, although technically, coriander is the seeds of the plant. • I have grown this simply for the seeds! A few plants produce a ton, I dried them in paper bags in the garage, and when I was done shook the seeds off. Annual – full sun, water 2-3 times per week, feed using all purpose plant food. Maintenance: mulch to keep down weeds. • Aromatic, feathery foliage is an attractive filler in the herb or flower garden. • Leaves, seeds, and the stem are all edible. 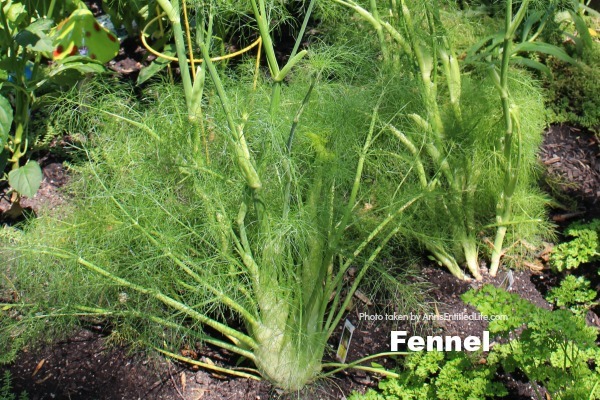 Hubby likes fennel so I grow several plants every year. • Keep surrounding area weed-free. Short lived Perennial normally grown as an Annual – sun, well-drained soil, fertilize sparingly. • Mints are the easiest of any herb to grow. In fact, if you do not contain it in a pot, mints WILL overtake your garden. • If you have a friend that grows mints, ask them for some cuttings or a rooted plant. Root cuttings in water. My best advice for this one is to keep it in a plastic pot (bury the pot underground) to keep it contained, and when it starts to get too big, cut it bag ruthlessly, and throw away the clippings. You can also grow mints in a large container on a patio. Perennial will come back every year. This is my most popular mint post: Why you NEED Lemon Balm in Your Garden. • Easy to grow, but start from plants at your local garden supply store. If you sow from seeds, start indoors early. • Whether you like the flat leaf or curled leaf varieties, both will look great in your garden or a pot. • Cut whenever you need it, but do not take more than a third of the plant at once. • Freezes well for winter use. • Also an excellent indoor plan. I’ve kept a pot of parsley on my sunniest windowsill in winter and it did great. Biennial – full sun, water daily, feed using all purpose plant food. Maintenance includes weeding and pinching back for a fuller appearance. Here are some simple instructions on How to Harvest and Grow Parsley. • If you live where there isn’t an extended hard frost, you should be able to grow this one in your landscape. Rosemary varieties range from low creeping groundcovers to shrubs and can be trained into small trees and topiaries. All of them smell great. • If you are not lucky enough to live where this can be part of your year-round garden, move your plant indoors. As long as rosemary gets watered on a regular basis, it will survive with low light. • I like to use rosemary stalks as skewers for cooking chicken on the grill. Perennial – full sun, will live for many years if wintered properly. • Sage is another herb that can over-winter in almost every climate. • Grows about two feet tall, and comes in many varieties. The sage varieties with variegated leaves are less hardy. • Sage likes full sun with well-drained soil. • Sage makes your Thanksgiving turkey and stuffing taste out of this world. Perennial – full sun, start from plants or cuttings. • This one makes a great groundcover. Use thyme between rocks or brick to fill in space with a fragrant green carpet. It also makes a great addition to a raised bed where it can trail over the edge. Perennial – sun, water weekly during dry spells, feed regularly. This is just a short list of some of the easiest to grow herbs. Most herbs are almost weed-like plants in their native areas, do not fuss over them too much. As your confidence grows, you can add to your collection, and have one of the most enviable herb gardens around. Please remember that none of this is meant as medical advice. I am not a doctor and do not play one on the internet. Please consult a physician if you have any questions about using herbs so your doctor can better explain to you the benefits, possible side effects, and any warnings about herbs. • Herbs 101 – a great overview of herbs, uses, and book recommendations. • Tips for Growing an Herb garden Year-round – indoor herb garden advice. 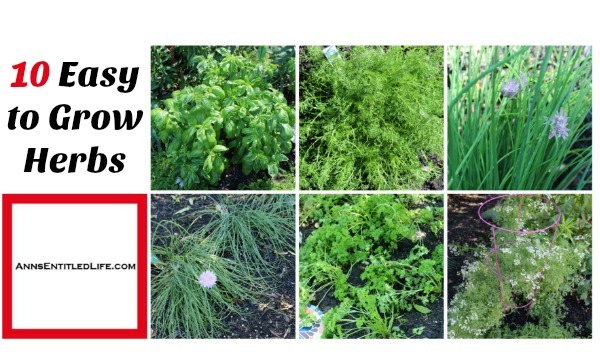 • 10 Herbs Your Need to Grow – herb advice, culinary and medical uses for listed herbs.